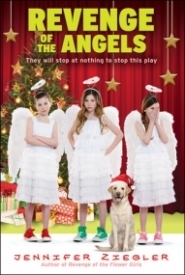 The Brewster triplets from Revenge of the Flower Girls meet The Best Christmas Pageant Ever, in a new, sweetly hilarious holiday story from Jennifer Ziegler! When we last saw them, Dawn, Darby, and Delaney Brewster stopped their big sister from marrying the wrong guy, proving that they can accomplish a lot when they work together. Now, they are turning their smarts and high-energy hijinks to something completely different: their local Christmas pageant! They've been practicing looking wise and stroking long, fake beards in preparation for their roles. But what if they're not cast as the wise men? What if instead they have to play angels in the pageant? Distasteful. Deplorable. Dreadful. And it's not like anything else is going their way this holiday season, either. Can the triplets figure out what to get for their mom, solve a mystery about a stolen Santa, and recover their holiday spirit in time for the pageant? Of course they can! And they'll do it with humor and charm, or they're not the Brewster triplets. Dawn, Darby, and Delaney Brewster are a very driven set of triplets with the goal of conquering the United States via becoming the president, Speaker of the House, and the Chief Justice of the Supreme Court, respectively. Right now, they’re focused on snagging the church pageant roles of the Three Wise Men they were robbed of. Their outrage over being denied the roles solely because they’re girls results in all sorts of fun. If someone tries to tell my niece she can’t do something or play a certain role because of her gender, I hope she does what the Brewster girls do and fights it. The hijinks they get into looking for their beloved Mr. Neighbor’s family heirloom Santa figurine makes for a fun, believable B-plot. Late-night surveillance, night-vision goggles, a game of detective,… I would have done many things to end up in their shoes when I was 11/12, but such games were only in my daydreams or the monthly spy books/gadgets I ordered from the Scholastic catalogs my English teachers handed out in class. I’m an old fart now, but the Brewster girls reminded me of what it was like to be their age. If you didn’t read Revenge of the Bridesmaids like me, the girls will get you up to speed on what little you need to know, so you won’t be lost. At times, it can be hard to tell the girls apart since all three share POV chapters written in first-person. Darby is the dreamer, Dawn is the leader, and Delaney is the one who can’t stay still. They sound different enough, but their internal monologues have a tendency to blend together. Sometimes, I only remembered who was narrating because she’d say her sisters’ names and I went through the process of elimination! They seemed to have an extraordinary amount of freedom for their age too. My parents wouldn’t let me walk down on the street on my own or with friends, let alone all over town. Then again, I grew up heavily sheltered. Suburbia is a serious drug. Whether or not you’ve read Revenge of the Bridesmaids, you’ll surely laugh out loud and enjoy the ride throughout Revenge of the Angels. It’s the perfect read for when you want something winter-flavored and sweet as sugar.